Custom awareness bracelets help to show your support. Lance Armstrong is the most famous testicular cancer survivor. Armstrong is known world-wide for his battle and defeat of testicular cancer and 7 Tour De France victories after surviving a near death fight against the disease which had spread to his lungs and brain. Though he has recently admitted using performance enhancing drugs, his victory over testicular cancer and rise to the top of the grueling cycling world is still remarkable. Perhaps more important to the Armstrong story is the awareness Armstrong raised for cancer in general and testicular cancer specifically through the creation of the Livestrong Foundation. Many events for testicular cancer awareness occur in conjunction with testicular cancer awareness month in April. 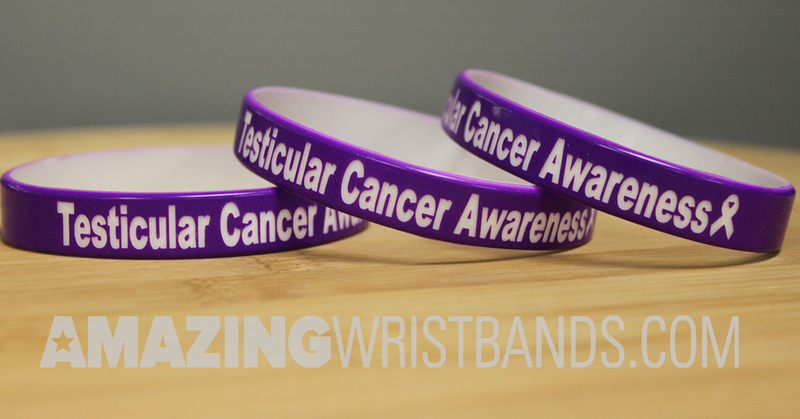 You can help spread awareness for testicular cancer by wearing a wristband showing your support for those who have, or have survived, the disease. When you design your testicular cancer wristbands with Amazing Wristband’s online tool, you can choose your message, font, artwork and more. The tool is easy to use and many of our silicone bands can be delivered in just a few weeks and even sooner if necessary. Though the recognized color representing testicular cancer is royal blue, a full range of colors are available for your customized bracelet. Every year, about 8,500 men are diagnosed with Testicular cancer and more than 350 die from it. Though it is only 1% of diagnosed cancers, testicular cancer is the leading type of cancer in men ages 15-35. Tumors are metastatic meaning they can spread to other parts of the body including lymph sytem, lungs and brain. Although genetic history may increase the odds of getting testicular cancer, it can affect men with no family history. It is important that men pay attention to abnormalities in their testicles. Regular self exams are recommended for all men regardless of age or race. Testicular cancer usually affects only one testicle. Fortunately, testicular cancer is a highly treatable disease. In cases where the cancer has not yet spread, survival rates are nearly 100%. In cases where it has spread, the survival rate drops to 80%. Treatments include surgery, radiation and chemotherapy. At AmazingWristbands.com, we sell only 100% latex free products that are non-allergenic and latex free. We offer free shipping, free artwork, free design, and free color matching. Build your bands today!